Hortus Camdenensis | Arbutus canariensis Duham. ‘The specimen of this plant, preserved in the Banksian Herbarium, was discovered by the late Mr. Francis Masson, growing in the woods in the Island of Teneriffe, where it forms a tallish tree. 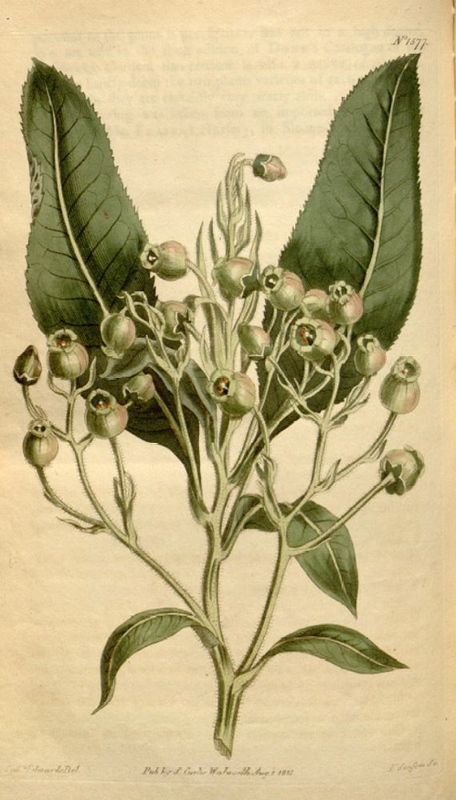 […] The colour of the flowers, as in Arbutus Unedo, varies from greenish-white to red. The specimen from which our drawing was made, was communicated by Mr. Whitley, from Fonthill, last May. It flowered also at the same time at Messrs. Malcolm and Sweet’s Nursery, at Stockwell-Common, but did not produce any fruit. Mr Masson observes, that in the Canary Isles the berries are made into a sweet-meat.’ [BM t.1577/1813]. ABR pl.664/1815. First listed in a handwritten note in an 1850 catalogue although not included in the 1857 catalogue. [MP A2947a]. It may have been a very early introduction to the gardens as Edward Macarthur provided seeds or plants to the Sydney Botanic Garden in 1823 [RBGS AB]. 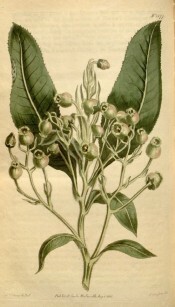 Arbutus procera Sola ex DC.